After recently joining the company, Jordan is already a strong pillar of the Heating Company team. We’ll be giving you more information on those people working on the ground at Heating Company, the people that you’ll meet either on the phone, if you pop to our office, or even around your home, to fix your heating issues. 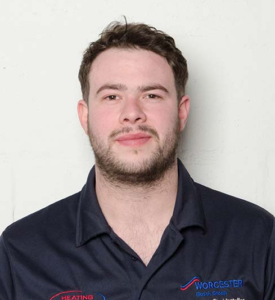 Jordan has over 5 years experience in Plumbing & Bathrooms Installations. He is excited to soon complete both his Gas Safe & OFTEC qualifications to become fully certified in the heating and plumbing trade. When not assisting our clients with broken boiler issues, Jordan loves to spend time with his family and exercise. There’s little chance you’ll spot Jordan going up a ladder, as he is terribly afraid of heights! He is working hard on this, but at the moment we are happy to provide him with helping (and supporting) hand! Does your household require a boiler installation? You might spot our dynamic team member Jordan flying to the rescue – unless your boiler is in the attic! Updated Vehicle Fleet for Heating Company!